Background Australia has one of the highest skin cancer rates in the world. Early detection and treatment of skin cancer is vital to reduce the morbidity and mortality associated with this disease. 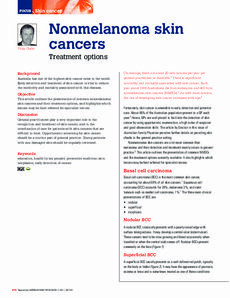 Objective This article outlines the presentation of common nonmelanoma skin cancers and their treatment options, and highlights which lesions may be best referred for specialist review. Discussion General practitioners play a very important role in the recognition and treatment of skin cancer, and in the coordination of care for patients with skin cancers that are difficult to treat. Opportunistic screening for skin cancer should be a routine part of general practice. Young patients with sun damaged skin should be regularly reviewed.